Vertical high performance cutting (HPC) of aluminum and particularly heavy-duty cutting of steel and titanium mean that a rigid and stable machine design is essential. The GANTRY SD with high moving Y-bridge is clearly designed for stability and is ideal for these demanding applications thanks to the generously dimensioned guide rails and drives as well as large guide rail spacing. 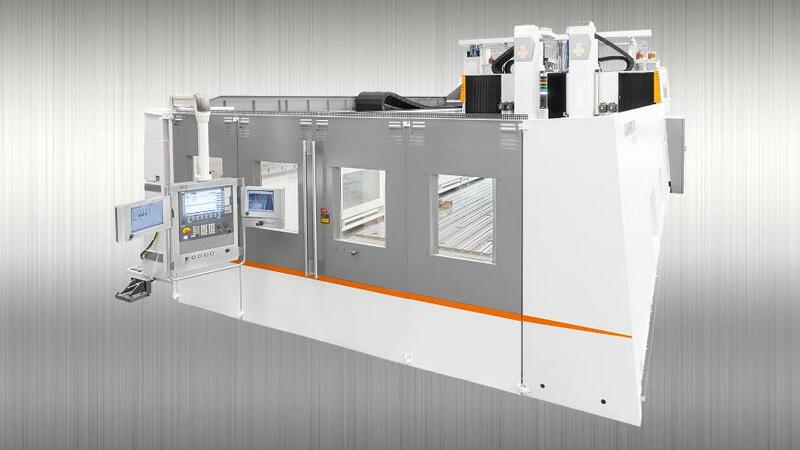 The Upper GANTRY machining center offers high power and speeds and also guarantees high stability and the necessary precision for 5-axis simultaneous machining of large, high-volume and heavy workpieces made of aluminum, steel and titanium. Compared with the GANTRY HD, the GANTRY SD series does not just offer maximum stability but also has larger axis travels in Y and Z. The modular system design permits customization in accordance with individual requirements. Configure your machining center specifically for your needs and benefit from the outstanding flexibility of the extensive module catalogue, which makes it possible to select different table sizes, the number of Y-bridges, the tool magazine configuration and the number of machining units, for example. The large machining table of the Upper GANTRY machining center offers various options for optimum clamping of individual workpieces.